Listening to music on a run or talk radio on a leisurely walk is something we’ve been doing for decades. In the 90s we took a Walkman with its FM/AM radio and in the last decade many started using the FM tuner built into many ‘candy bar’ feature phones. 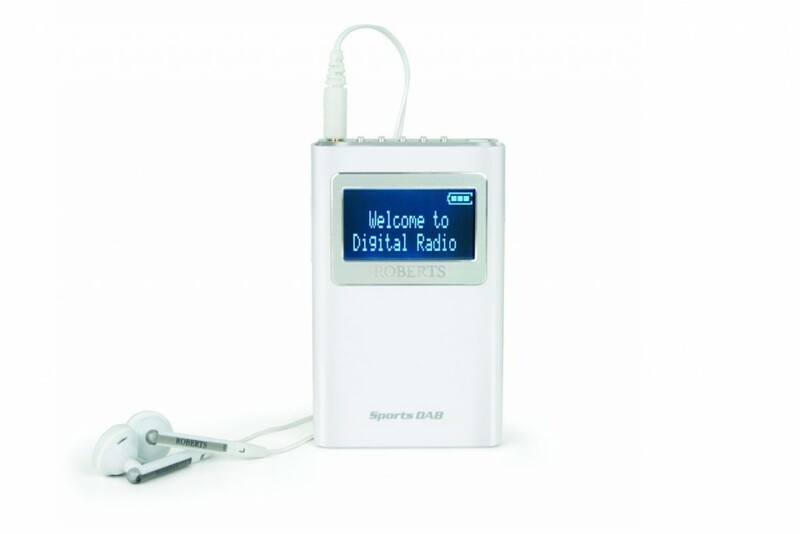 Personal digital radios like the SportsDAB 5 from Roberts make it easier than ever to listen to a range of music and speech-based stations on the go. Stations on FM, DAB and DAB+ are selected using the grey ‘jog wheel’ on the right side of the radio. This control also switches between FM and DAB and can be used to access other features, like scrolling text. The large LCD display is aided by a blue backlight. Volume is controlled on the opposite side with a raised rocker style button. The SportsDAB 5 takes two AA batteries and doesn’t have an external power option. Some may prefer a radio with a dedicated rechargeable battery. The radio weighs just 66 grams and is smaller than many smartphones, although it does measure 20mm deep. Clever design puts the all-important power button and headphone socket on the top of the radio, along with five preset buttons. This means you can flick between your favourite stations without having to remove the radio from your pocket. Setting presets is easy – once tuned into the station you would like to store you can hold down the desired preset button. Stereo earphones are included, but earphones you already use or prefer for their comfort or sound can be used instead. A protective case isn’t included with the radio, so if you plan to drop it into a coat pocket every time you walk the dog you might benefit from a PU leather case. These are available for £10 to £15 and although not made by Roberts come with the correct cut outs for the screen and controls, as well as a belt clip. Verdict: Weighing in at just 66 grams this personal radio is ideal for running and workouts.